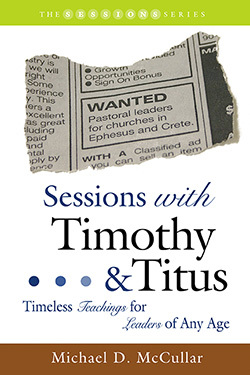 Sessions with Timothy & Titus is an eight-session study unit designed to provide a compelling preview to the books of 1& 2 Timothy and Titus. Each session is followed by a thought-provoking page of questions that allow for a deeper experience of the scriptural passages. These resource pages can be used by seminar leaders during preparation and group discussion, as well as in individual Bible study. Michael McCullar takes readers on a journey through Paul’s two letters to Timothy and his letter to Titus. Commonly referred to as the Pastoral Epistles, these personal letters served as guidance to a pair of young, inexperienced church leaders who required structured guidance and encouragement. Students of these letters today, however, will find that Paul’s advice to Timothy and Titus contain timeless teachings for leaders of any age.